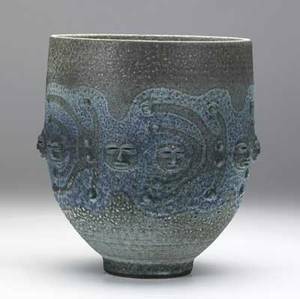 Scheier stoneware vessel with applied decoration of faces, covered in frothy blue and purple glazes, 1983. signed and dated. 9 1/2" x 8" dia." 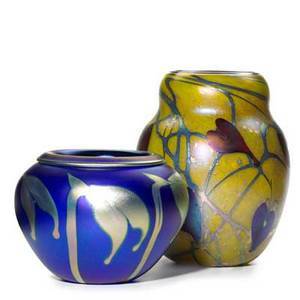 Archived auctions similar to Scheier stoneware vessel with applied decoration of faces, covered in frothy blue and purple glazes, 1983. signed and dated. 9 1/2" x 8" dia." 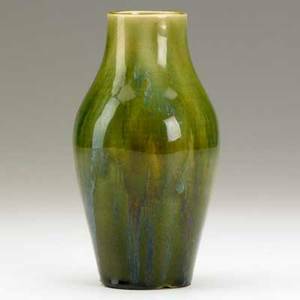 Hugh robertson; dedham; baluster vase covered in flambe green and blue glazes; chips to bottom rim; signed; 7" x 3" dia. 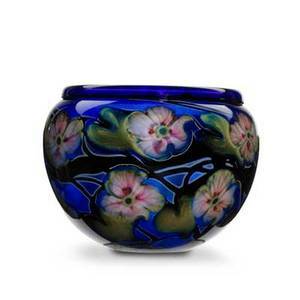 Charles lotton glass; large multi-flora bowl in cobalt blue with pink florals, 1997; signed and dated; 9" x 12" dia. 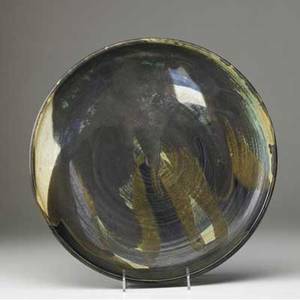 Toshiko takaezu thrown ceramic center bowl covered in brown, blue and black dipped glazes. signed tt. 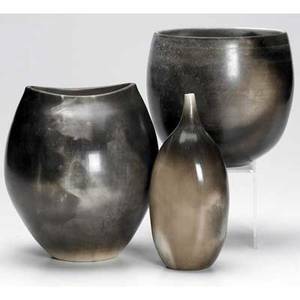 2 1/4" x 14 1/2"
Ron dean three ceramic pieces covered in mottled black and gray glazes. all signed and numbered. 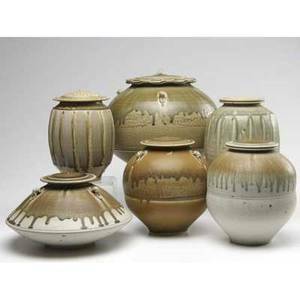 largest: 6 1/2" x 6" x 5 1/2"
Tom turner six porcelain covered jars covered in brown, olive and ash glazes. all signed. 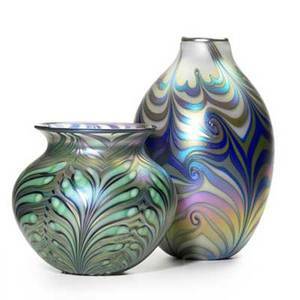 largest: 10 1/2" x 11 1/2"
Charles lotton / daniel lotton glass; two vessels with iridescent pulled feather decoration, 2003/2006; signed and dated; taller: 12" x 7" dia. Joseph hoffman / wiener werkstatte hammered sterling silver raised vessel with applied decoration of celestial nature, ca. 1922. stamped made in austria/ww/jh/900. 3 1/2" x 5 1/4"
Salvador dali (spanish, 1904-1989); five lithographs in colors from "the divine comedy" series, 1960 (framed separately); each signed and dated; each: 12" x 8 5/8" (sight)"
Charles lotton glass; two vessels with iridescent vines, 1999/2004; signed and dated; taller: 10" x 8" dia. 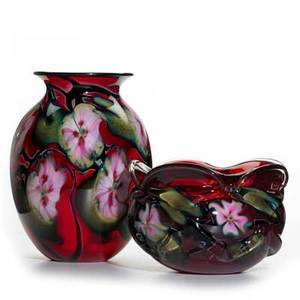 Charles lotton glass; multi-flora vase and bowl in ruby with pink florals, vase with iridescent interior, bowl with free-form surface, 1998/2007; signed and dated; taller: 11" x 8" dia.